What Are The Best Online Bachelor's in Electrical Engineering Programs? What Else Can I Expect from an Online Bachelor's in Electrical Engineering Program? Electrical engineers design, build, and maintain electrical equipment. From the largest power plant to the smallest electrical circuit, electrical engineers play a vital role. If you harbor a passionate for science, technology, engineering, and math (STEM), a bachelor's in electrical engineering will give you the knowledge and skills to begin a rewarding career. Overall, college graduates with a bachelor's in STEM-related fields can expect generous salaries throughout their careers. Electrical engineers are no exception. Earning a median annual salary of $94,210, you can support yourself in nearly every region of the country. Also, specializing in certain subfields such as renewable energy can make you a highly sought-after employee in this rapidly growing energy sector. From this article, you will gain resources to help you begin researching the U.S.'s best online bachelor's in electrical engineering programs. The foundation of any electrical engineering program is a curriculum that teaches the math and physics principles that govern electromagnetism. After mastering these topics, students move to courses that show how these concepts apply to modern electrical systems. However, your online electrical engineering program should provide you with much more than a cookie-cutter education. Electrical engineering is a broad, evolving field that requires degree holders to stay up to date with the latest advances in electrical equipment. When researching programs, consider what kind of work environment would best suit you. You can find electrical engineers in work environments ranging from nuclear power plant control rooms to the top of massive wind turbines. The latter represents one of the fastest growing fields of electrical engineering: renewable energy. Electrical engineering programs that offer a concentration in renewable energy give their graduates a tremendous advantage in the job market. Online programs have multiple requirements for prospective students. Requirements include, but are not limited to earning an associate degree, a GPA cutoff, or prerequisite courses. Also, your program's graduation requirements may also include an internship or work experience component. Founded as an agricultural college in 1889, Clemson opened in 1893 to fewer than 450 students. Now home to more than 23,000 learners, Clemson offers almost 200 academic programs through seven colleges and boasts a 19-to-1 student-to-faculty ratio. Clemson offers an online bachelor of science in electrical engineering degree-completion program to engineering professionals with previous coursework in the discipline. Students transfer prerequisite coursework in chemistry, mathematics, computer programming, and physics. Learners pursuing Clemson's online electrical engineering degree study circuits, electromagnetic fields, electronics, controls, and power systems. Clemson offers all lecture courses online and encourages students to complete laboratory classes at universities and technical colleges. The online bachelor's in electrical engineering also allows learners to complete specialized electives applicable to their interests and goals. During two electrical engineering capstone projects, students work on an approved design project with their peers. These projects may necessitate visits to campus. Overall, students complete 126 credits to earn the degree. Ideal applicants demonstrate a minimum 3.0 GPA in prerequisite classes. Applicants submit a formal application, fee, and transcript information for consideration. Clemson holds accreditation through the Southern Association of Colleges and Schools Commission on Colleges. The electrical engineering program maintains accreditation from the Engineering Accreditation Commission of the Accreditation Board for Engineering and Technology, Inc. The flagship institution of the State University of New York System, Stony Brook moved from its Oyster Bay campus to Stony Brook, New York in 1962. Stony Brook offers more than 350 undergraduate and graduate programs to more than 26,000 students. With 12 academic schools, on-campus and online learners benefit from Stony Brook's comprehensive research, practical, and innovative educational offerings. The online bachelor's in electrical engineering at Stony Brook includes classes in digital logic design, electronics circuits, semiconductor devices, and random signals and systems. Students complete 44 credits in major courses and 12 technical elective credits in specializations like digital signal processing, computer communications, and electric machinery and energy conversion. Stony Brook offers the electrical engineering bachelor's degree online in cooperation with the University at Buffalo, Binghamton University, and Open SUNY. Students complete fully online asynchronous courses. Since the program emphasizes upper-division coursework, applicants must complete prerequisite classes in calculus, physics, and mathematics for admission. Applicants need a minimum 3.0 GPA in prerequisite coursework. Stony Brook's bachelor's in electrical engineering program maintains accreditation from the Engineering Accreditation Commission of the Accreditation Board for Engineering and Technology, Inc. The school also holds approval from the New York State Education Department. Located in Grand Forks and founded in 1833, UND is the state's oldest public university. From its 550-acre campus and online school, UND hosts almost 14,000 learners through more than 225 academic programs. UND's online bachelor of science in engineering program includes 125 credits that learners complete in 4-5 years. The degree emphasizes practical and technical skills while building foundational knowledge and analytical competencies. Learners complete classes in circuit analysis, electric and magnetic fields, electronics, computer-aided measurement and controls, and embedded systems. Students can focus their degree in computer science, aerospace engineering, or biomedical engineering. The aerospace engineering concentration emphasizes aviation and altitude systems, while the biomedical degree includes coursework in anatomy for paramedical personnel and human physiology. Learners who pursue a computer science specialization focus on systems programming, distributed networks, and computer hardware organization. All students complete two senior design classes that serve as a capstone experience. During senior design courses, learners work within teams to build, test, and assess an electrical engineering prototype. Applicants submit transcripts and standardized test scores for consideration. Transfer students benefit from articulation agreements that UND holds with institutions from North Dakota and nine other states. 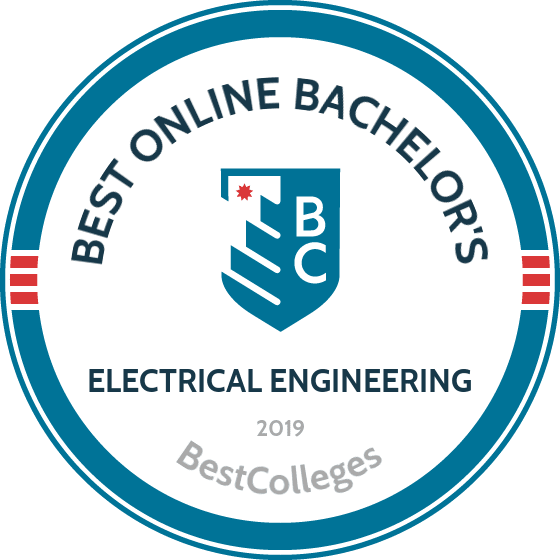 The bachelor's in electrical engineering holds accreditation from the Engineering Accreditation Commission of the Accreditation Board for Engineering and Technology, Inc. UND maintains regional accreditation through the Higher Learning Commission. An institution designed for adult learners, TESU offers undergraduate, graduate, and certificate programs in more than 100 fields of study. Founded in 1972, TESU awards transfer credits for professional and military training, professional licensure and certification, and through portfolio assessment. Students can transfer up to 80 credits from two-year institutions and 117 credits from four-year institutions. TESU's online bachelor of science in electronic systems engineering technology requires 124 credits. Students develop academic, industrial, and engineering technology expertise. Program objectives include building commitments to remain current in the field, demonstrating leadership and professionalism in the electronics industry, and advocating for the discipline. The online bachelor's in electronic systems engineering and technology program includes 60 credits of general education classes, 15 credits of electives, and 49 major credits. Students must complete coursework in computer concepts, statistics, calculus, physics, chemistry, and computer programming as part of the general education or elective requirements. Major courses in electric circuits, electrical devices, communications electronics, project management, and digital electronics accompany an electronic engineering technology capstone course. During the electronic systems engineering technology program, learners participate in two program planning sessions to assess transfer credits, establish a sequence of courses, and develop career goals. TESU maintains accreditation through the Middle States Commission on Higher Education. TESU's bachelor's in electronic systems engineering technology holds accreditation from the Engineering Technology Accreditation Commission of the Accreditation Board for Engineering and Technology, Inc.
One of three schools within the Eastern New Mexico University System, ENMU provides more than 60 undergraduate and graduate programs. The largest regional university in New Mexico, ENMU hosts more than 6,000 learners on its main campus, at Cannon Air Force Base, at extension centers throughout the state, and online. Designed for students with strong mathematical backgrounds, ENMU's online bachelor of science in electronics engineering technology requires 120 credits. Learners complete required classes in programming fundamentals or computing concepts, algebra, trigonometry, and calculus prior to beginning 57 credits of major coursework. Courses in circuit analysis, industrial electronics, semiconductor devices, and renewable energy technology accompany advanced classes in control systems, electrical power and machinery, and digital design. Students complete an electrical engineering technology capstone class to analyze, design, document, and apply degree competencies to a problem in the field. The online bachelor's in electronics engineering technology prepares students for careers in electronics, instrumentation, controls, electrical circuits, manufacturing and testing, and industrial control. Students in ENMU's online bachelor's in electronics engineering technology program complete readings, labs, tests, and projects entirely online. Live and recorded lectures give working professionals convenient and flexible access to degree content. ENMU also offers online students access to an extensive distance education library and career service assistance. ENMU holds accreditation from the Higher Learning Commission. Your electrical engineering program will challenge you in many ways. To earn your degree, you will have to master higher level math and physics concepts. Working online, you will collaborate with other students to complete various projects. Studying full-time, you can expect to finish your program in approximately two years. Part-time students will need more time to complete their degree. The best online electrical engineering programs have similar curricula. However, subtle differences between programs mean that your experience may differ from the courses listed below. Electric Power Engineering: As the name suggests, this course will instruct you on how energy flows through electrical systems. For example, you will learn how an electrical power plant transmits power to people's homes. An electric power engineer course is essential if you hope to work in a power plant after graduation. Electromagnetics: This class incorporates both history and mathematics to teach you about the forces that govern electromagnetism. Throughout the course, you will apply famous equations such as Gauss's Law to understand how electric fields behave. No matter your future career, this course remains the foundation of an education in electrical engineering. Electronic System Design: After you gain a basic understanding of electrical engineering, this course asks you to apply your knowledge in a real-world setting. For example, you and your classmates will work together to create electronic systems that solve problems. Excelling in this course is a sign to future employers that you can contribute to a team. Fundamentals of Wind Power: With the renewable energy sector experiencing record growth, the need for electrical engineers in this field has never been higher. In this course, you will learn not only how wind turbines generate electricity, but also how to identify suitable locations for their placement. This skill alone will make you a valuable asset to renewable energy companies both in the U.S. and abroad. How Long Does it Take to get an Online Bachelor's in Electrical Engineering? Many factors influence the length of time it takes for students to earn an online bachelor's in electrical engineering. If you have credits from other colleges or an associate degree, your school may allow you to apply these credits toward your bachelor's degree. The vast majority of online programs will ask you to complete prerequisites before applying. These prerequisites may take one or more years to complete. Once accepted, your program may require you to complete an engineering internship. If you already work as an engineer, your work experience should fulfill this requirement. Working at an individual pace, you can finish your bachelor's program in approximately two years, earning approximately 120 credits. If your program uses cohort learning, however, your program may require three or four years to complete. In cohort learning, students take courses together and at the same pace. This learning style encourages collaboration and can help you network with future peers in the engineering field. When researching a potential college or university that offers an online electrical engineering degree program, be sure to confirm whether that school has received accreditation. Accreditation functions to protect students against academic programs that do not provide an adequate education. Your program should have at least two types of accreditation. The first is regional accreditation. The six regional accreditation agencies oversee all academic institutions throughout the United States. For online programs, national accreditation is just as important. For decades, national accreditation agencies have reviewed distance education programs, ensuring that students receive the same education as they would learning on campus. There are also independent accreditation agencies that review programs within a particular academic field. Colleges or universities that offer online electrical engineering degrees should have accreditation from the Accreditation Board for Engineering and Technology (ABET). For almost 90 years, ABET has both accredited engineering programs and performed research into educational best practices. The Department of Education (ED) is the most significant piece of the accreditation puzzle. The ED oversees and regulates regional accreditation agencies. If one of these agencies does not perform well, the ED can revoke its status. One of the largest independent accreditation agencies, the Council for Higher Education Accreditation (CHEA) is a consortium of over 3,000 degree-granting institutions. CHEA accreditation represents that a college or university provides exceptional programs to its students. To learn more about accreditation, please consult the ED and CHEA websites. Earning an online bachelor's in electrical engineering puts learners at a distinct advantage in both job placement and salary. A recent study by Georgetown University revealed that approximately 82% of all electrical engineers hold a bachelor's degree or higher. According to Georgetown's Center on Education in the Workforce, earning a graduate degree in electrical engineering can increase your salary by as much as 20%. Many electrical engineers earn a graduate degree after gaining some job experience. Many companies pay for their employees to earn graduate degrees, as they view the expense as an investment. Coastal states offer electrical engineers the best salaries. In California, a large number of technology companies compete for employees, resulting in overall higher salaries. California also boasts the largest number of electrical engineering jobs in the nation. However, Alaska offers electrical engineers the highest overall salaries. You can attribute Alaska's position at the top of the list to its higher cost of living and efforts made by companies to attract talent from out of state. From writing at home to working at a nuclear power plant, by pursuing electrical engineering, you can expect to benefit from multiple opportunities to adapt your career as your personal and professional needs change over time. The professions below represent only a sample of the potential career paths you can pursue with an online bachelor's in electrical engineering. From commercial airliners to satellites, aerospace engineers draw from their educational background to develop the latest flying machines. As an aerospace engineer, you will use your electrical engineering education to ensure that your team's projects are safe, efficient, and financially feasible. In addition to a bachelor's degree, many companies that hire aerospace engineers require applicants to have a master's degree or work experience. Broadcast and sound engineering technicians must operate, maintain, and repair recording equipment. One of the career's advantages is that professionals have the ability to work for a variety of employers ranging from major movie studios to local government agencies. The sensitive electronics involved make an electrical engineering degree a highly sought after qualification in the eyes of potential employers. Industrial engineers evaluate both employees and manufacturing processes to reduce waste, save money, and make the best product possible. Although colleges offer bachelor's in industrial engineering degrees, many different types of engineers move up to this position. With a bachelor's in electrical engineering, you will likely need work experience before potential employers consider you for an industrial engineering position. Nuclear engineers ensure that their nuclear power plants remain efficient and safe. On the job, they often monitor plant operations. Many nuclear engineers work for medical device companies that produce equipment containing radioactive elements. Electrical engineers transferring into this field may need additional education or work experience. Technical writers create the written materials consulted by engineers and other professionals working in STEM. Although some are independent contractors with multiple clients, most technical writers work full-time for large companies. Working as a technical writer requires not only technical knowledge, but also extensive job experience. Financing your online electrical engineering degree begins with filling out the Free Application for Federal Student Aid (FAFSA). Completing the FAFSA makes you eligible for specific work-study programs, low interest loans, and government grants. Along with the FAFSA, determine if potential colleges offer scholarships or work-study programs. Finally, don't forget about scholarships created for students studying electrical engineering. For example, the Microsoft Scholarship Program awards funding to college students studying STEM.